Growing Concerns Poetry Collective Workshop! 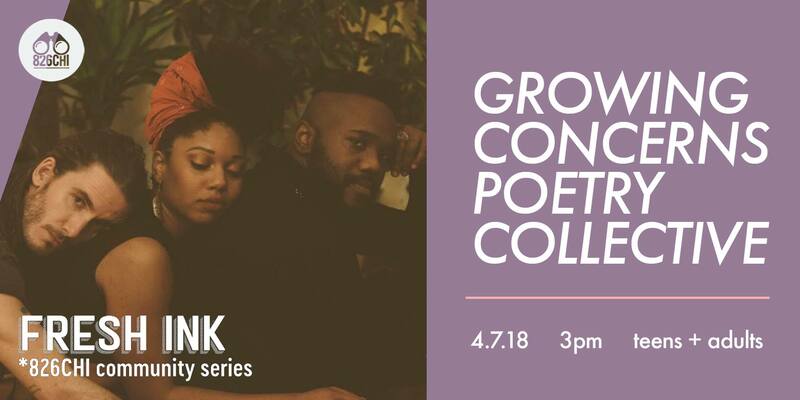 Growing Concerns Poetry Collective--a powerhouse trio that features poet McKenzie Chinn, rapper Mykele Deville, and beat maker Jeffrey Michael Austin--fuses lyrical narrative + hip-hop poetry with original music + soundscape to create spoken word performance that is greater than the sum of its parts. The collective released its inaugural album, "We Here: Thank You For Noticing" in August 2017. Their latest anthology, "Five Fifths," published by Candor Arts, interrogates the nature of selfhood, blackness, community, love, ritual, and vulnerability while celebrating perseverance and survival in the face of generational and systemic marginalization. WHERE // The Wicker Park Secret Agent Supply Co./ 826CHI on 1276 N. Milwaukee Ave.
HOW // There's limited availability for non-826CHI students, so make sure to reserve your $10 ticket ASAP! You can register on this page or on our Facebook event page. FRESH INK events are always free for 826CHI students. All proceeds benefit 826CHI's free writing programs, which serve over 2,500 students annually.